I can’t help but feel like I am drowning at times. It’s like the laundry, the dishes, my overflowing email inbox, the therapy and doctor appointments, and the uncertainty about the future are all going to suffocate me at once. Sometimes I’m so overwhelmed and feel like I can’t handle it all. I’m like an Olympic gymnast, balancing on the beam between crazy optimism and trying to be realistic. Most of the time, I’m able to keep my balance. But, sometimes all of those things suffocating me cause me to fall to the ground. If I land on the side of optimism, life seems good – often better than it really is. I seclude myself in Elijahland, thinking that everything’s going to be all right. Elijah will be just like his peers when he grows up, I tell myself. No one will even know what happened to him during his birth. I pretend that nothing is wrong; ignoring those emotions I’d rather not touch. I’m secluded, in my own world with my boys. Then I find that I’ve fallen off my beam again and those emotions I tried to avoid have smacked me in the face. This time I’m on the side of reality and I ponder what my son’s life may entail. I wonder if he still won’t be talking or feeding himself when he’s 5, 10 or 15. What if…what if…what if…? It’s not a pretty place to be. I wonder how I’ll handle him when he’s older. What if he can’t understand me or communicate with us? How will we handle it all? I know that we all feel overwhelmed at times, whether or not we have a “special needs” child. I’ve had this overwhelmed feeling before and it always subsides eventually. As I write this, I no longer have that drowning feeling. I’ve reminded myself to take it one day at a time, to not worry about my house (it’ll be here to clean tomorrow), people will forgive me for unanswered emails or phone calls (the ones that love me anyway), and to give the future up to God. I can ponder all I want, but only God knows what the future holds. There’s that scripture that says don’t worry about tomorrow. I know that God will take care of us and when I remember that, I realize that there is no reason to feel like I am drowning. So, here I am, trying to stay on my balance beam. I’m apt to fall again, but hopefully I can be quick to get back on the beam. Being realistic about Elijah’s future (realizing that he’s going to have ongoing difficulties in his life) while remaining optimistic for him (not setting any limits as to what and who he can be) is exactly where I want to be. I’m not drowning, I’m swimming. I just wish it felt less like treading water sometimes. Famous Boy – Elijah is Featured in Another Newspaper Article! Today Elijah was featured in the Leader Telegram, a newspaper published close to our hometown. We’re so excited that Elijah is getting the exposure and that people will be hearing more about HBOT through his story. We are convinced (and it seems so are his therapists) that HBOT has helped Elijah. Simply too many things have changed since he received the therapy. If you’d like to read the news story, click here. Both articles about Elijah were very well-written. We feel very grateful and very blessed that he’s been in two newspaper articles in just one week! How thrilling! I don’t even know how to begin to express my gratitude to everyone who has prayed for and taken a vested interest in our little man. God’s involvement in Elijah’s life is undeniable. Since I don’t think I can ever say it enough: Thanks for everything. His “Elijah fans” are indispensible. I love words…well, most of the time. It’s seriously hard for me to say the word and since writing is also my voice, it’s honestly hard for me to even type it...You’ve all heard it a million times before. Some of you get just as angry as me when you hear it. Some of you probably use it on a regular basis, not quite understanding the pain it inflicts on parts of our society. Some of you don’t even know that it’s offensive. Have you guessed it yet? Retard. There, I said it. I hate that word. Yes, I know that hate is a strong word. If there was something stronger, I’d use that. I abhor, despise, and detest that word. There, I think those words are strong enough. Fortunately, I grew up in a household where the r-word was not allowed. To me and many others, the r-word is a swear word. I was taught that the r-word should never be uttered in reference to anyone or anything. I was taught it was hurtful. Am I perfect in my speech? Absolutely not (but more on my shortcomings later…). I’m not going to start trying to have words outlawed. I’m simply pleading with anyone who reads this to be extremely careful about the words you use. Do you know their history and where they come from? Are you inadvertently hurting someone with your speech? The r-word has an extensive history behind it and is never used in a positive manner. People with cognitive disabilities have been discriminated against – even killed – for simply being alive. Don’t get me started on the newest form of discrimination – abortion of those who might have a disability. When you call your friend a retard because they did something stupid, you’re disrespecting each and every person who has an intellectual disability. In the past, I would have thought nothing of the words “pinhead”, “spaz”, or “spastic”…now those words stab me in my heart because I realize that those words are making fun of my son’s diagnoses. Sticks and stones may break bones, but the childhood rhyme isn’t quite accurate…words do hurt. We can ignore them, yes, but they still sting. I’m not perfect and I know that I’ve said things I wish I hadn’t. I’m ashamed to say, I’ve even said things since Elijah was born! Case in point…I remember almost saying the word “spaz” a few months back in reference to myself. I was about to say it when I thought, “Wait a minute…Spaz sounds an awful lot like spastic…maybe I ought to look into that.” Sure enough, a short internet search later and I discovered that Spaz was short for spastic. The tightness in Elijah’s muscles as a result of his spasticity is something he has to deal with on a daily basis. How can I describe myself in those terms and make light of his situation (and the situation of many others)? More recently, I’ve found myself saying something else. As you all know, Elijah has developed temper tantrums. The words “he had a fit” have come out of my mouth in reference to his temper tantrums. When I’ve said it, I didn’t feel right. Another internet search and I found that indeed “having a fit” is another way of saying that someone had a seizure. It’s insulting and insensitive to make light of something as serious as a seizure. Elijah had seizures for two days straight and there are many families out there who have to deal with terrifying life-robbing “fits” each and every day. I’m not sharing my shortcomings so that you can judge me. I’m sharing because I know that often we say things, not understanding the full implications and hurt behind them. I’ve done it too and no one is perfect. But when there are words that make fun of real medical conditions or disabilities and you use those words to describe yourself or your friends in a derogatory manner, it’s offensive. I’m simply asking that anyone reading this will try to eliminate the r-word (and any other offensive words) from their vocabulary. It’s not funny to make fun of people with cognitive disabilities…and if that word comes out of your mouth that is exactly what you are doing…regardless of your intentions or who you are saying it to. I wouldn’t have intended to hurt anyone by saying “spaz” or “having a fit”, but that doesn’t change the fact that it is offensive. I think it’s time we show some compassion for one another. Please pledge to not use the r-word and take the time to eliminate hurtful speech from your vocabulary. I’ll try not to trip on the way down from my soapbox…Thanks for listening. Our little man is officially sixteen months old! And at just sixteen months, Elijah has made his newspaper debut in the Dunn County News, a newspaper from our hometown. (If you want to get technical, this would actually be the second time he’s been in the paper - as we also announced his birth). It was pretty exciting to see the little guy’s picture and story in the newspaper. If you’re interested, you can read the story here. We feel quite grateful that they wrote this article about Elijah and included his life story in our hometown paper. [I did want to make one clarification to the story. It said that Elijah can say, “mama” and “dada” and unfortunately he is not able to say those two wonderful words yet. Believe me, if he were, I’d be shouting the news from the rooftop! While Elijah did say “mama” once, he has not said it since. I have to believe that someday we won’t be able to get him to shut-up…I smile just thinking of it!]. 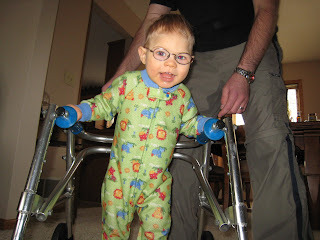 We recently set up a Benefit Fund for Elijah to help offset the cost of therapy. We are tentatively planning to do another round of HBOT for Elijah in March, possibly coupled with intensive OT, PT and Speech Therapy. HBOT isn’t covered by insurance and only part of the OT and PT would be. As Elijah’s parents, we want to do as much for Elijah as we possibly can while he is still so young and his brain is still forming. So, we are starting the process of asking for donations and thinking of fundraiser ideas. If you have any thoughts or would like to help out, please let us know. We’ve also created a flier to ask for donations, which you can see here. If you’re willing, please disperse this flier as you see fit (i.e. put it on bulletin boards, etc). If you have nothing to give but prayers, that’s the most important gift of all. Please ask for success in our fundraising efforts. Elijah is never as cooperative working with his OT as he is with his PT. Since he works with his OT immediately after his PT, he’s probably a bit tired from already working so hard. But, part of the issue is that he’s so focused on his gross motor skills (i.e. crawling and walking) that he doesn’t care much about anything else. I was really excited by something his OT said this week. She mentioned that she thinks cognitively, Elijah is beyond the things we’re trying to teach him. He gets bored, he gets frustrated, and he decides that he’d rather do something else, namely jumping or walking. That’s really exciting as it’s says great things about his developing brain. Our lovely school OT encouraged me to get Elijah age-appropriate toys. Again, that’s so exciting! I have to remind myself to never underestimate Elijah. We also saw our Physiatrist, Dr. Nice Guy, for a follow-up appointment last week. He seemed pleased with Elijah’s progress and didn’t have anything to recommend other than to “keep doing what we’re doing.” Hmm, sometimes I wonder why we even visit doctors in the first place. Still, it’s nice to have uneventful appointments. Elijah is crawling! I think I can safely say that Elijah has officially started to crawl today. When something really interests him, he takes a few crawling steps, falls, gets up and takes a few more. It’s so exciting! He did it for me this morning in pursuit of his switch toy, did it for his therapist today, and then did even more for daddy after work tonight. The more he practices, the better he’ll get at it. Yay! Our little guy is mobile! Hallelujah!